Western blot analysis of extracts from various cell lines using Axin1 (C76H11) Rabbit mAb. 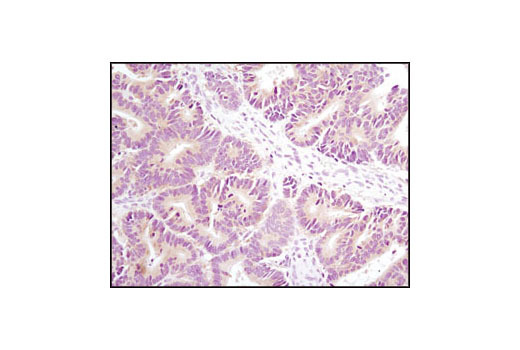 Immunohistochemical analysis of paraffin-embedded human colon carcinoma using Axin1 (C76H11) Rabbit mAb. 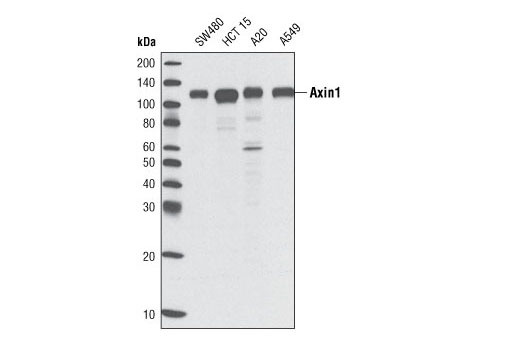 Axin1 (C76H11) Rabbit mAb detects endogenous levels of total Axin1 protein. Monoclonal antibody is produced by immunizing animals with recombinant human Axin1. Salahshor, S. and Woodgett, J.R. (2005) J Clin Pathol 58, 225-36. Zeng, X. et al. (2005) Nature 438, 873-7. Davidson, G. et al. (2005) Nature 438, 867-72.